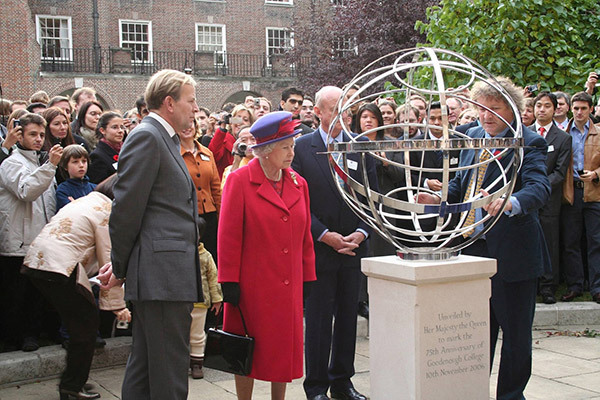 Her Majesty Queen Elizabeth II speaks with artist David Harber at the unveiling of his armillary sphere sculpture at a British university in 2006. Harber has been commissioned to create a similar sundial to commemorate Samford University's 175th Anniversary. Samford University has commissioned a renowned British artist to provide a sculpture commemorating the institution’s 175th anniversary. David Harber, an award-winning artist with an international reputation for innovative design, is creating a signature armillary sphere sundial for installation at the highest point of the university quadrangle outside the doors of A. Hamilton Reid Chapel. Samford chose a 31-inch sphere fashioned from surgical grade stainless steel, according to Michael Morgan, executive assistant to the president and coordinator for Samford’s 175th anniversary. The sphere will be engraved with the names of the university’s founders, a verse from the Book of Psalms, and compass points to global destinations that reflect Samford’s academic and spiritual roots. England-based David Harber Ltd. has been producing sundials, sculptures and water features for more than 20 years. “The first piece I made was an armillary, and I was lucky enough to sell it, which effectively got us going — or got me going — and business has grown ever since,” Harber noted. Morgan said installations from Harber’s studios can be found around the world at exclusive hotels and major airports, and also at the University of London, various colleges of both Cambridge and Oxford Universities in the United Kingdom, Princeton University in the U.S., and Al Rawdha Royal Palace in Bahrain. Harber was selected to receive the 2016 Queen’s Award for International Trade. Announced each year on April 21 — Queen Elizabeth II’s birthday — the awards recognize exceptional achievement in business and represent the highest honor that can be bestowed on a UK company. The sculpture will arrive in Alabama in early fall for installation before Homecoming Weekend Nov. 10–13, Morgan added.